For a few years, the IAP has had the privilege to praise one scientist who has made outstanding contributions in the field of our yearly colloquium through the award of an IAP medal. Among recent awardees, I can cite Prs Faber, Linde, Blandford and our dearly departed Wal Sargent. 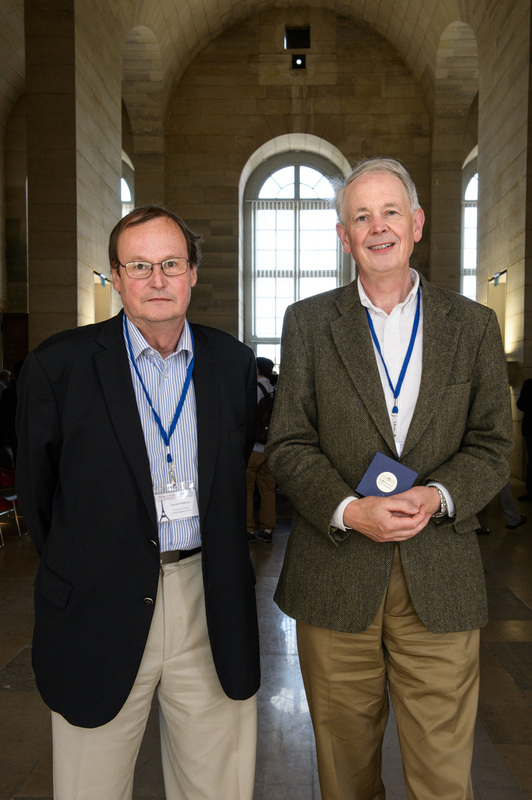 This year, I am pleased to award this medal to professor James Binney for his inspiring contribution to theoretical Galactic and extragalactic astrophysics. You may wonder what this medal will add to the fame of a scientist who has already received prestigious awards and honours, including the Maxwell Prize of the Institute of Physics in 1986, the Brouwer Award of the American Astronomical Society in 2003, the Dirac Medal in 2010, and the Eddington Medal in 2013. We do not intend to compete with these prestigious prizes. The IAP medal is meant to be more a friendly demonstration of our recognition and a way to acknowledge his influence, granted by colleagues who have been working in the field, and even, for some of them, have had the privilege of collaborating with him. Pr. Binney did a PhD (Doctor of Philosophy was the exact title) at Christ Church college under the supervision of Dennis Sciama, which he completed in 1975. He was a visiting scholar at the Institute for Advanced Study in Princeton in 1983-87 and again in the fall of 1989. After holding several post-doctoral positions, including a Junior Research Fellowship at Magdalen College, Oxford, and a position at Princeton University, James Binney returned to Oxford as a University Lecturer and Fellow and Tutor in Physics at Merton College in 1981. He was subsequently made Ad Hominem Reader in Theoretical Physics in 1991 and Professor of Physics in 1996. He is mostly known for his work on the structure of our own Galaxy, the dynamics of galaxies, and all the mechanisms that control and regulate the galaxy evolution. More specifically, he has been a major contributor to fields as varied as the physics of cooling flows, the processes of AGN feedback, and in the field of galactic dynamics, the development of the torus techniques and orbit modelling. His original work relevant to the topic of this conference pre-dates the rediscovery of the importance of cold flows in galaxy formation by a couple of decades! He is also definitely one of the most inspiring scientists in the field. He has had an incredible impact on Galactic and extragalactic astrophysics, while writing a series of reference papers, books, and reviews. One of his reference books, "Galactic Dynamics", written with Scott Tremaine, is an amazing best seller. This book had two editions: the first in 1988, the second in 2008 for which over 80 000 copies were sold. Another book on Galactic Astronomy written with Michael Merrifield in 1998 is also amongst the top-selling astronomy textbooks. The importance of Pr. Binney' work can be judged from the ADS citation index were the Binney-Tremaine's book has more than 4700 citations. It is quite unusual that the most cited contribution of a researcher is a textbook! All students starting to works in galaxy physics should start by reading Binney & Tremaine, but the high citation index also indicates that senior scientists make an extensive use of this book. For all of these reasons, I am pleased and honoured to award the IAP medal to Pr. Binney, and I strongly advise all the IAP students to read, and read again "Galactic Dynamics"!